Home / blu dot / design / furniture / gus / gus* / home / home fair / home style / interior design / jie pambid / rockwell / rockwell tent / Simplify Your Home with Gus* and Blu Dot! Simplify Your Home with Gus* and Blu Dot! If there's one mall in this busy and crowded metropolis that I love visiting, no matter what time and day, that'd be the Power Plant Mall in Rockwell. It's not that I'm "pa-sosyal" or what, it's just that the place feel so refreshing, relaxing and most off all not crowded. I think this is the only mall in town that wasn't that "packed" every single day. And for that, Rockwell is the love. And yesterday, Friday, I spent another leisurely morning walk there as I visited the just opened Secrets to Style Your Home 100% Rockwell: An Interior Design and Home Fair. When I was a kid, I honestly wishing to be an interior designer, but since we were and still are not that rich, I changed plans and pursue a different path. But if there are chances that I can do interior designing in our house, I voice out my ideas and do it, for pleasure's sake. Hehe. According to my mother, I'm a messy person, so as much as possible I prefer a place that doesn't have too much furniture pieces in it, like my room - some kind of a minimalist. I wanna apply that same idea to our entire house, but my mother, who loves flowers, figurines and everything, is kinda hard to convince. But probably, with the right pieces and really chic looking units for our home, I know I can convince her someday. Good thing, when I was at this fair, I stumbled upon Gus* and Blu Dot there. Imagine, 20% DISCOUNT on all of their items! Wow! Inside the Rockwell Tent, their products were the first ones that will welcome you. Gus*, who has been a known household brand in Canada, offers these ergonomic, kinda neutral colors and minimalist pieces that are perfect for homes and lofts. I personally fall in love on this sofa. The totem fabric and the foam that they used feel really good, adding the simple edges and really simply approach. This is perfect to give you that modern look for your place. While the other brand, Blu Dot, hails from the United States. I find it more manly since the colors were mostly gray and blue, but according to the supervisor who was manning the exhibit, in their showroom, there are really a lot of stuff to see, including the likes of this red chair and lamp. This chair is a powdered-coated steel ships flat and folds along laser-cut lines that create dynamic and comfortable seating. This is said to be one the signature pieces of Blu Dot, so if you think that Blu Dot is everything blue, well, your are wrong. If I'm not mistaken, the price range of Gus* is a little higher compared to Blu Dot, but when I heard its warranty, I know that you'll liked it more than Blu Dot. Haha! During my visit on this exhibit, I got to meet the creative mind behind the Gus* and Blu Dot's showrooms, Miss Van. She's the interior designer for the showrooms of these brands, which you can visit at Greenbelt and Greenhills. Though, she may look so young, she's been into designing since 2007. She shared to me that Gus* and Blu Dot's clients can avail a free lay-outing or floor planning service from her if they bought Gus* and/or Blu Dot's pieces. Wonderful, right? Sample of her works were also on display near the Gus* and Blu Dot's exhibit area, so if you wanna see some of her works, feel free to drop by here. I also happen to get Gus* Philippines and Blu Dot Philippines' contact info and Facebook pages, so if you wanna more about their stores and products, you can visit their pages, or their main website at http://www.livingspace.com. 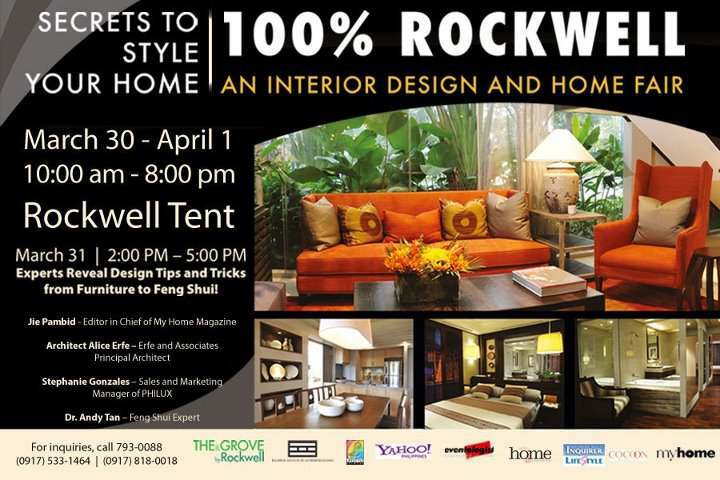 But if you wanna avail the 20% DISCOUNT, which I'm sure you do, visit the Secrets to Style Your Home 100% Rockwell: An Interior Design and Home Fair. 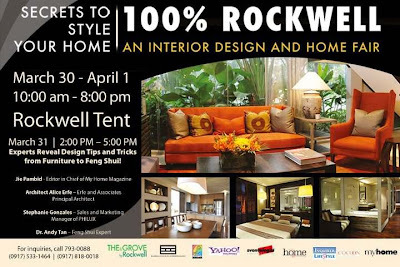 This fair is up from March 30 until April 1, 2012 here at Rockwell Tent. You might also be lucky to get some designing tip from the experts such as Jie Pambid of My Home, Architech Alice Arfe, Stephanie Gonzales of PHILUX and Dr. Andy Tan, a Feng Shui expert. Wow, furniture fair! I'm definitely going!